PWR.bet are a relatively new bookmaker. 0ver 25,000 live events/month, over 50 sports and over 2,000 different betting markets. If you’re looking for inplay they have everything you need. Take advantage of the Sports welcome offer so you can feel the action anywhere you want. On your computer and mobile or download the app and take the game with you. 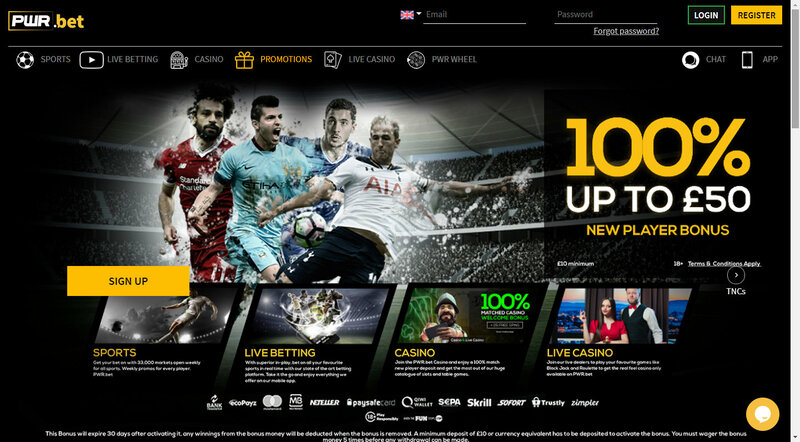 Originally launched as an online casino, PWR.bet have recently expanded into sports betting. Offering over 25,000 live events per month, over 50 sports and over 2,000 different betting markets. Get Your PWR Wheel On! Take your casino game to the next level with our PWR Wheel, Every new players gets a spin on the PWR wheel for their first deposit and then every time the level up. With weekly prizes and a bonuses you will always get rewarded for being a PWR.bet member!